"On the summit of this range, at the eastern extremity, just where it begins to fall off toward the valley of the Nunundah, is the wild weird-looking place called in the rough language of the early settlers, the "Devil's Den." But allow me to suggest for its more euphonious name, and call it the Demon's Home; and well may it be imagined the home of the bad spirit, for it is a collection of high rocks and broken fragments piled promiscuously by the careless hand of nature in a confused and mingled mass, underneath the largest of which is a small cave, in which the Demon may be supposed to hide and repose himself by day, and coming out by night to roam about seeking whom he may next devour. Before you take a view of the left-hand range, turn around and look toward the west. You see spread before you " Sleepy Hollow, Junior," -- that of Washington Irving's luxurious fancy being Sleepy Hollow, Senior a quiet and pleasant little valley divided into farms, interspersed with farm-houses, barns and orchards, those certain evidences of American industry and thrift. Look to the western extremity of this pretty hill-bound valley and you will see the stage road as it winds its way up the hill towards Alton. To the right of the road, as it winds up the ascent, you see a high, conical hill raising its winds up the ascent, you see a high, conical hill raising its tall peak gradually towards the clouds. 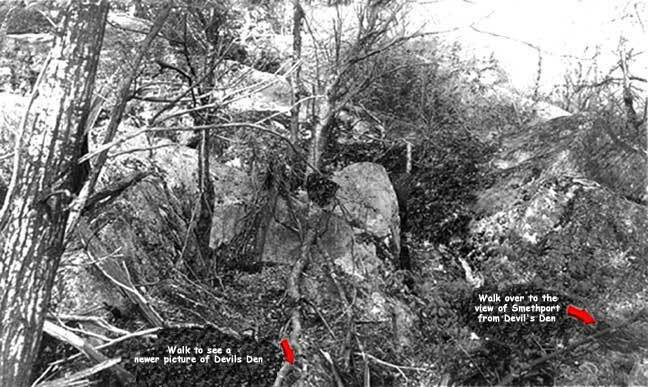 At the summit of this hill, which may be reached by a winding footpath, is a remarkable rock called in the rough vernacular the "Devil's Temple." I suggest that this name also would be shorn of its harshness by calling it The Demon's Temple Rock. It is a ponderous fragment of an immense rock which nearly or quite covers the summit of the hill peak; the fragment as large as a church having been in one of those convulsive throws of nature severed from its parent rock and left standing as a monument of nature's power. the table rock is a small sloping cave from the center of which issues a large spring of deliciously clear and cool water. This temple is a fitting place to have been selected by one of the orgies of Dante's Inferno for the worship of his Satanic Majesty; and as demons are believed to be fiery spirits, the demon of this temple would find an admirable fountain in the spring under the rock to quench his thirst. This temple has a lonely site, being surrounded on all sides except the east by an extensive forest of densely growing woods; on the east it is within half a mile of the skirt of the hollow. Its immediate surroundings are tall hemlocks and with undergrowth of laurel, so that the foliage is all of the darkest hue; of this rock would be a strange place to spend a night and witness the rising of the sun at morning. At night he would sometimes be startled by the sharp barking of a fox, perhaps by the snarling of the wild cat, and anon by the hideous howl of the wolf who on come the distant hilltop and was calling to one of its companions, prowling in some swamp perhaps far distant; after a while he would finally be treated to a serenade from a fatherly or motherly old owl, who was high up in a distant treetop, monotonously and mournfully repeated his continuously reiterated who who who! And another hooting owl would answer him from his perch upon another tree perhaps a mile distant. Looking around to guess where the monotonous music came from, the tenant of the rock might possibly see the fiery glaring eyes of some panther as he lay crouched upon the large branch of a tree near at hand, watching for a luckless deer or other animal who might happen to pass near enough to be within reach of his fatal boundary, when one spring of the monster would end the days of the luckless animal destined to make a meal for this cougar of the forest. The rockbound tenant in time might become drowsy, possibly sleep, soon to be awakened by an unearthly screech from another owl of a different species, far off in the woods, whose frightful screech seemed to be made for no other purpose than to see how near it could imitate the cry of a woman in agony, screaming in her frantic efforts to save an endangered child. The lonely tenant would find it a long, weary night and often wish, and perhaps pray, for the coming day. When it did dawn and show its dimly shadowed light around him, he might notice a crackling made in the dry underbrush by a deer, which had risen from his lair, and was searching about amongst the under wood to browse for its breakfast; he might hear the mating song of the wild birds; he might see the awkward limping rabbit ambling in the next cluster of laurels, or hear the whir of the pheasant on the wing as it passed him. When the sun had risen and gilded the valley with its brilliant rays of light, if he rises from his rocky couch and can find a vista through the treetops, he would see beneath and beyond him the quiet nook of Sleepy Hollow, lying gracefully and calmly reposing like a coy maiden sleeping in her unconscious beauty, and possibly a glimpse of the village beyond. Soon he would see the farmers moving about in different directions attending to their different domestic avocations; looking across the valley he might see a lean thief of a carrion crow as it flew lazily, flapping its slow wings over the fields and crying " Caw - caw - caw!" as it sought the neighboring woods to hide or eat some treasure it had plundered from the farmer's garner of barnyard; and perhaps a flock of nimble blackbirds or blue jays, retreating from some foraging expedition on one of the corn fields. When the sun was fully up and had bathed the whole valley in light, the scene might be crowned by the exhibition of a large hawk, nearly the size of an eagle, beginning its circle over the center of the hollow, far above the hilltops, in the air and slowly circling around, extending that circle, until it embraced the whole extent of the valley in its circuit and had reached in its aerial flight from hilltop to hilltop and gone up- up - up- until it was nearly lost to human vision, as it upward soared to greet the rising sun." ... Last Saturday four boys braved the snows of Brennan’s Hill and plowed their way to Devil’s Den. Starting about 11:00 a.m., the boys went through the pasture to Secret Castle (a large rock at the edge of the woods) and then started up the trail towards the den. Plowing through drifts, sometimes three feet deep, for approximately a mile, they arrived at the den about 12:30 o’clock. (Scribe not responsible for accuracy of this statement) and proceeded to build a fire in the Devil’s Den. After dinner a study was made of a goodly number of tracks and a bit of signaling was done. Although the going was a bit hard at time, the boys report it was worth the effort to gain the top.